Quick and easy meal full of fresh flavors of lemon and parsley. Dovetailing tips: Cook an extra 1 pound of chicken to be used for meal 3, Pesto Zucchini Noodles. Preheat grill on high, 5 minutes. Once hot, carefully use tongs to rub an oiled paper towel over grates to clean and ensure no food residue or dirt. 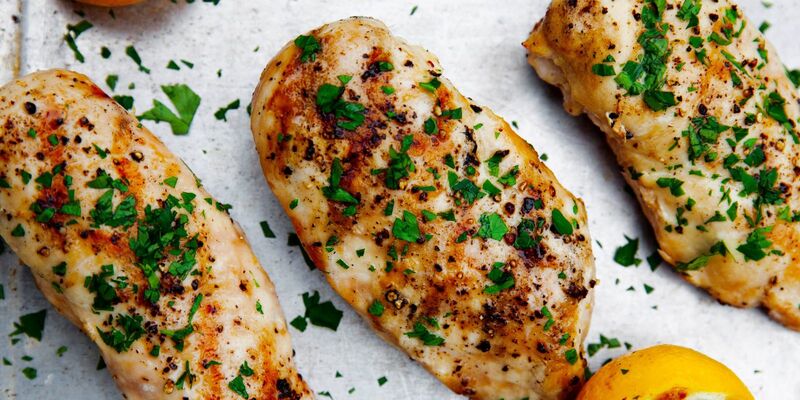 Drizzle olive oil on chicken breast and cut sides of lemon, then season chicken generously with salt and pepper. Using long tongs, place chicken breasts on grill and cook, covered on high, 3 minutes. Flip breasts and continue cooking on high, 3 more minutes. Reduce grill heat to low and flip chicken again. Place lemons, cut side down, on grill. Cover and continue cooking, 3 minutes more. Flip chicken again and cook 3 more minutes on low, or until a meat thermometer reads 160° when inserted into the thickest part of the meat. To serve, remove chicken and lemons to plate. Squeeze grilled lemon on chicken and top with parsley.